Michael McFadyen's Scuba Diving - South Maroubra As residents and regular visitors would know, Sydney is regularly afflicted with a weather change known as the southerly buster. In the days following such a cold front, the wind and seas are generally raised to such an extent that most dive spots are undiveable. During this weather, the only places in Sydney that are usually considered to be able to be dived are Shiprock in Port Hacking, Shelly Beach at Manly and Camp Cove and Parsley Bay in Sydney Harbour. Nearly every other spot, especially the ocean dives are out of bounds. However, there are two ocean sites south of the city that are diveable in all but the biggest southerly and south-easterly winds and seas. One of these is the subject of this article. Once again, this site at South Maroubra Beach is one that I first dived with my brother Stephen. Like the other dives I have described in this series, we had never seen people diving here although it looked a great site and Nigel Marsh had written a short article about it in DIVE Log in the late 1980s. Maroubra Beach is, in my opinion, the best beach in Sydney. It has the most reliable surf, a wide expense of sand and is a fairly safe beach. In the 25 years or so from the mid-1960s it suffered hugely at times from sewage pollution from the Malabar Sewage Treatment Plant just to the south. However, with the opening of the new ocean outfall in September 1990 the water has improved dramatically to such an extent that people flocked back to Maroubra in the summer of 1990/91. Although sometimes affected by sewage before the outfall opened, it was still possible to dive this site so long as the southerly winds had not been blowing for too long. Now it is always free of sewage, no matter what winds are blowing. Access to this site is from the South Maroubra Surf Club carpark which is located off Fitzgerald Avenue, Maroubra Beach. After parking in the far corner of the carpark, walk to the top of the sand dune to check the sea conditions. If the surf immediately next to the rock pool in front of you is flat and there is not a strong rip flowing out through there, it is safe to dive this location. As the entry point on this dive is a long way from your vehicle, you can only dive here from the shore if the weather is cooler or else you will overheat on your walk out. As the title of this article indicates, there are two wrecks located in this area. They are the SS Tekapo and the TSS Belbowrie. The Tekapo was wrecked in May 1899 close to the southern headland and the Belbowrie sunk in closer on 16 January 1939. The Belbowrie, incidently, had a few incidents prior to being wrecked. On 24 November 1938, less than two months earlier, it rescued two fishers off Norah Head on the NSW Central Coast after their boat sank. 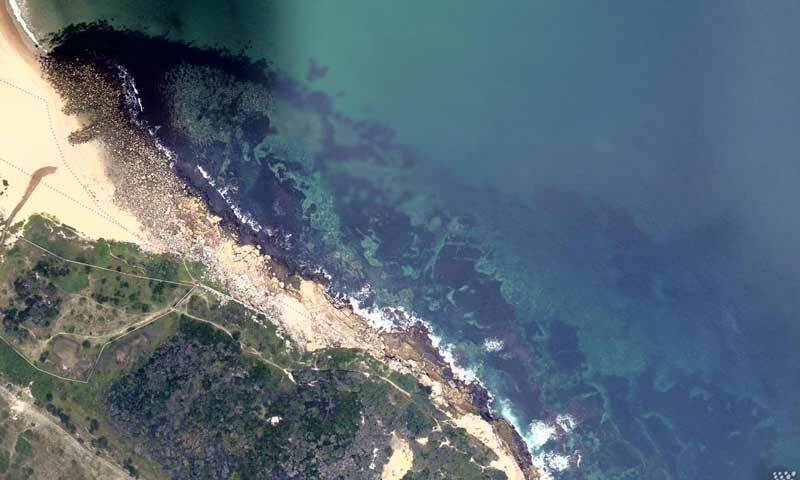 Almost 16 years earlier, on 26 June 1923, the Belbowrie ran aground on Wanda Beach near Cronulla, only a few kilometres to the south of here, but it was refloated. Its second accident was not as lucky. There is a great deal of wreckage to be found in the area, although very little is identifiable as specific parts of either ship. There are iron plates and girders all over the place, as well as some brass pieces. For more information on the wrecks see the linked articles above. Although the wrecks add to the enjoyment of the dive, the real attraction at South Maroubra is the fishlife, it really is prolific. In one dive here I saw over 50 different species of fish that I could identify. These included wobbegongs (one eating an octopus), Port Jackson sharks, serpent eels, common sea dragons, red firefish, yellowtail, yellowtail kingfish, snapper, bream, old wife, blue groper, moon wrasse, comb fish, senator wrasse, eastern rock blackfish, moray eel, cuttlefish and the largest dusky flatheads that I have ever seen. After gearing up walk parallel to the remains of the Long Bay Rifle Range fence to the rock platform. Walk out along the platform for about 250 metres until you reach a very small inlet. Along the way you will need to wade through the water if it is high tide to get around a large rock outcrop on the narrow platform just before the inlet. On the south-east corner of the inlet, there is an excellent entry point. Finish gearing up, enter the water and snorkel out about 20 metres. Submerge here and swim to the east until the depth is about 7 metres. At this spot you will find a small wall that you can follow to the south-east. After a short distance the wall forms into an amphitheatre like formation with a low cave on the southern side. Heaps of eastern rock blackfish can be found in the cave. All around this area are pieces of wreckage of the Belbowrie. Do not spend too long examining the wreckage as it is a long swim back to the beach and there is still plenty to see. From the wreckage, swim to the north-north-west. The seascape here is a jumble of rocks of all different sizes. Your depth will probably increase to 12 metres and you can even get to 15 metres if you stray a bit to the north. Eventually you will come to the edge of the reef where it meets the sand. From here, follow the edge all the way back to the beach. Lots of interesting fish can be seen all over and under the rocks that line the edge. Gradually the depth will decrease to 6 or 7 metres. If you are short on air, you can surface here and either snorkel back to the beach or exit onto the rocks behind the rock pool. With plenty of air, continue around past the pool into shallower water. There can often be a bit of a current flowing past here as it is common for a rip to form next to the pool. If there is any current, stay on the bottom and use the rocks to assist your progress. If you have surfaced earlier and have snorkelled to this point, use your remaining air to exit on the bottom. This section of the dive is so interesting that it really should not be missed. As well as the fishlife, numerous old bottles can be found in the sand and under the rocks. As you will only dive this location if there are no waves at the southern end of the beach, you will have no problem exiting the surf. A typical dive time here is 60 to 80 minutes, so make sure that you have a large tank and do not linger for too long in any one place. If at all possible, the dive should be done to coincide with the incoming tide. Do not rush the dive but likewise, do not take it too slow or else you will need to surface too early. After the dive, stop off at the shops at Maroubra Beach and examine the anchor of the Tekapo which can be found near the small obelisk in the park opposite the hotel.